The cost of attending UT-Austin and other UT System schools could soon rise. At a meeting Friday, the UT System’s governing board encouraged schools to consider increases that would keep up with inflation, perhaps 2 percent. The cost of attending the University of Texas at Austin and other UT System schools could soon rise. At a meeting Friday, the UT System’s governing board approved a framework that would allow schools to increase their tuition early next year. Schools were encouraged to consider increases that would keep up with inflation, perhaps 2 percent. But they will also be allowed to look at "reasonable and prudent additional increases that address issues of greatest institutional priority." That is needed, officials said, because inflation is making it hard for schools to keep up with rising costs and competitive job markets. They are losing talent in the state's thriving metropolitan areas because there are better-paying jobs nearby. “I worry a great deal about having the talent that our students deserve,” said David Daniel, deputy chancellor at the UT System. No increase is anywhere near finalized. The president of each university is expected to make a recommendation in the coming months. The UT Board of Regents will have final say and a vote will likely occur in February. Tuition rates are already set for the the current school year; any increase would be for the next two years. It's unclear how the schools will react. After Friday's meeting, UT-Austin spokesman Gary Susswein released a short statement: "UT-Austin has lower tuition than almost all of our national peers and has not raised tuition in nearly half a decade. Under the guidance and direction of the Board of Regents, we will work with student leaders to begin the process of examining out tuition rates for next year." 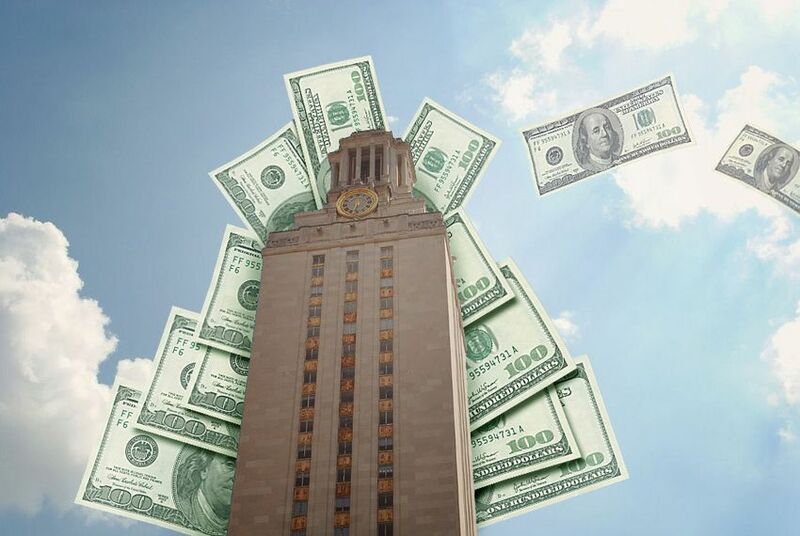 UT-Austin hasn't significantly raised its tuition since the 2011 school year. The average amount for a student taking 15 hours is now $4,905. A 2 percent increase would add about $100. Tuition increases are controversial. Lawmakers on both sides of the political spectrum have complained about rising higher education costs. Ahead of Friday's meeting, Lt. Gov. Dan Patrick, a Republican, released a statement warning against any increase. Instead of considering cost hikes, Patrick said, schools should look "for ways to make college education more affordable for students and families across Texas." Patrick argued in his statement that state funding for higher education increased significantly in the most recent legislative session. Daniel acknowledged as much in a presentation Friday, but noted that state dollars account for a shrinking share of university funding in Texas. He displayed a graphic comparing state funding for UT-Austin to 13 peer institutions, including the University of North Carolina at Chapel Hill, Purdue University, Ohio State University and the University of Wisconsin-Madison. UT-Austin ranked last, according to the list. Support for tuition increases was mixed. Opponents warned of the rising cost of higher education, and said state leaders won't be pleased with any uptick. The final vote was 6-2, with Regents Alex Cranberg and Wallace Hall opposing. "I am concerned that student tuition raises should be a last resort, not an expectation," Cranberg said. But Daniel warned that an inability to hire faculty and elite staff would be harmful for UT System universities. "Mediocrity at our universities is an even worse outcome," he said.